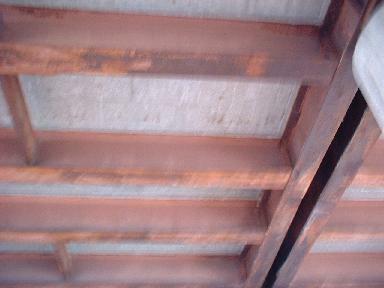 The photos on this page are from the way US 1 went until 1990. 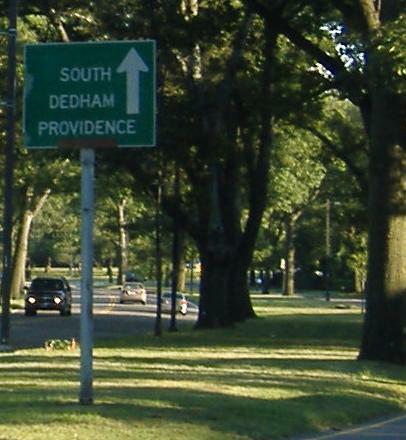 Instead of the current I-95/I-93/MA 3 multiplexes, 1 kept on going toward Boston, around the Emerald Necklace on such poetic roads as the Arborway and Riverway, up Park Drive (SB) and the Fenway (NB, and much less poetic if you know what fens are) to Storrow Drive via the Charlesgate, and then crossed the Charles River with I-93 between Exits 26 and 27. Of course, the MDC still thinks it goes this way - some of the following signs are newer than 1990. If you weren't careful, instead of going on Park you might accidentally end up on Boylston Street, which is actually a shortcut for the Riverway (so you were better off losing Route 1). I have no idea how good signage was once, but now, Park Road is one lane and there are no US 1 signs - the two-lane Boylston looks much more like a major road. 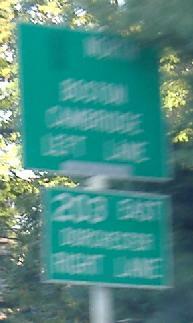 Washington St. NB, the way MA 1A used to run into Boston before being truncated to the VFW parkway just north of I-95. 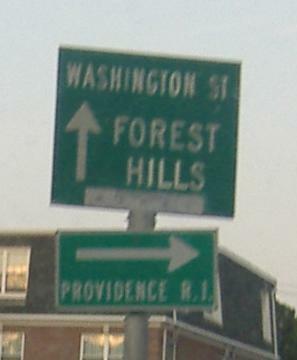 NB on the Veterans of Foreign Wars Parkway (which is also the name of MA 1A north of Boston, which possibly not coincidentally was once US 1). 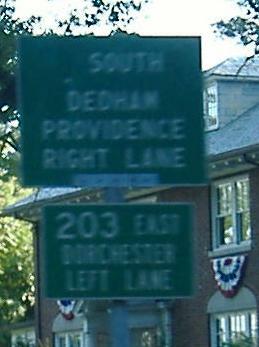 Signs of US 1 heading north as the VFW Parkway rolls on toward Boston. 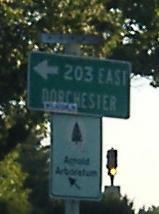 The last sign is in the MA 203/former US 1 rotary. SB through the same area, where for some reason there are four inner lanes and four outer lanes just north of the circle. The inner lanes merge back with the outer lanes, and SB all four head straight into the circle (NB, MA 203 WB is the only way into the outer lanes). 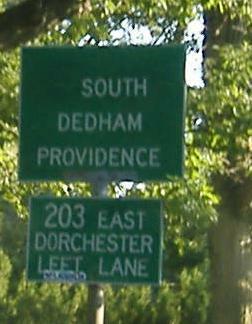 Just another example of Massachusetts confusion, I suppose. 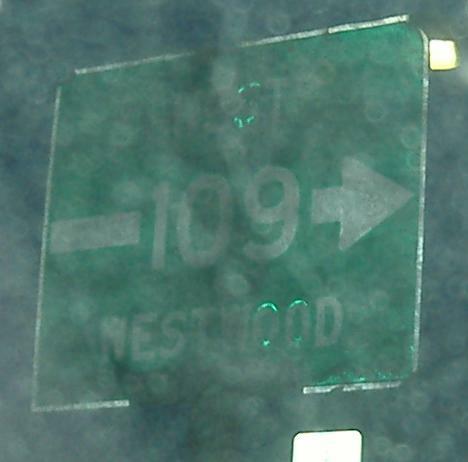 Now NB on the Riverway at Longwood Ave. in the Longwood Medical Center Area, these LGS's once said "C-1" on them - not US 1 as I suspected. Chris Commans explains that the signs predate US 1's routing over the old city route in 1971, and that they still showed "C-1" as late as 1990 before the greenouts. Given that the other LGS just say "1" and not "US 1", his explanation easily trumps mine. 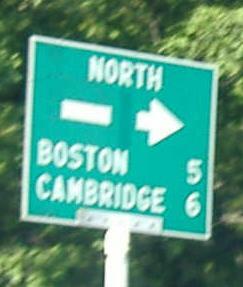 SB between there and Back Bay is the MA 9 interchange, a tight cloverleaf with two quadrants (the eastern ones) using the old road and a third (northwest) using the next block over. And with a little baby 9 shield. 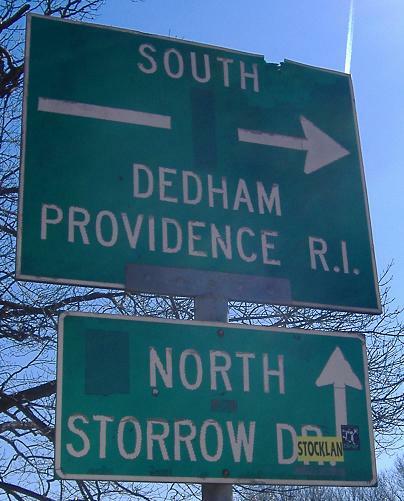 NB just before and after Brookline Avenue, where the Riverway turns into the Fenway (southbound is Park Drive, which heads northwest and meets MA 2 at Beacon Street - meaning Park Drive was once both MA 2 and US 1, with two blocks between them). Speaking of Park Drive, this is southbound on Park, yet one more indication of former US 1. 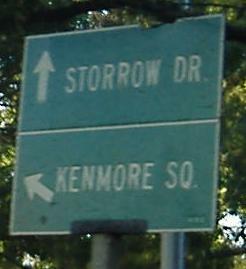 Former US 1 SB at Park Drive, aka Park Drive at its continuation. 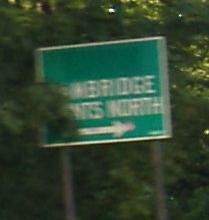 There is no sign to the left, and there are three total options (U-turn, left on Riverway/old 1, straight via the arrow presented here), so you gotta be a local to get it right. 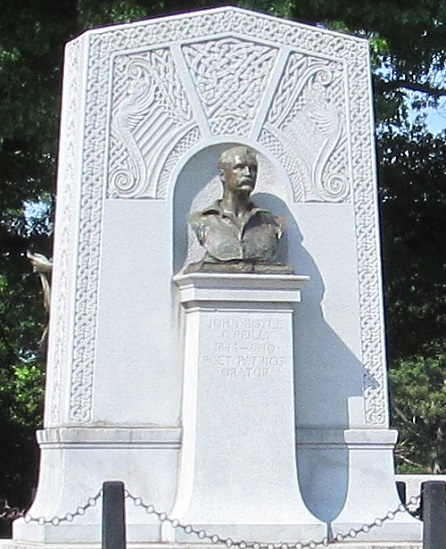 While all that's going on on the west side of the park, the east (NB) side gets a monument to John Boyle O'Reilly, poet, patriot, orator, but not the namesake of Boylston St. That honor goes to Ward Nicholas Boylston, whose name conveniently already ends in the suffix for a town, which was conveniently named after him along with the street in Boston. 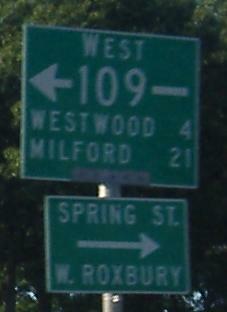 That town to the west really ought to be Boylstonville. 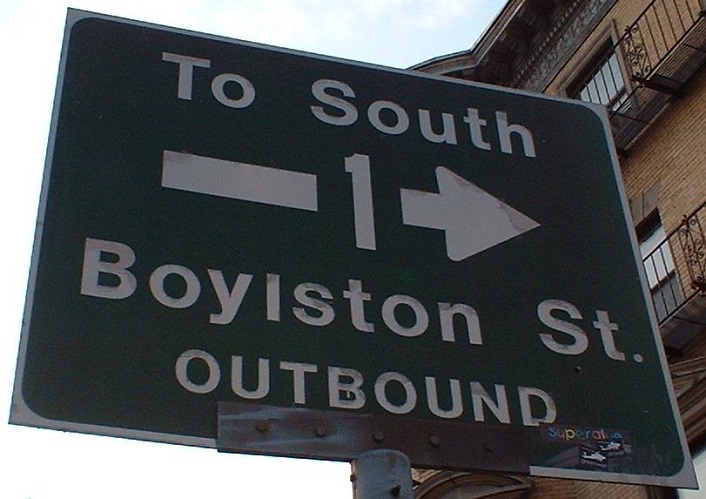 Just south of the Charlesgate, the SB side briefly follows Boylston Street in an odd intersection. 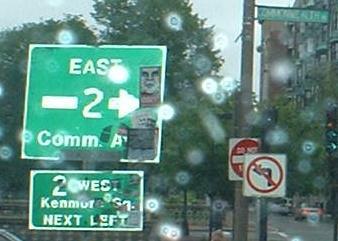 The inbound sign takes you across the Fenway (NB former 1) into Boston, while the outbound sign takes you toward the Fenway movie theater. If you're not alert, as I mentioned above, you miss former 1 making the next left onto Park Drive, and end up following Boylston St. to the Riverway. 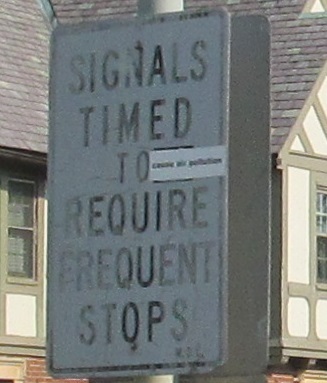 Speaking of Boylston, this sign stands one block west of Massachusetts Avenue, facing WB traffic. 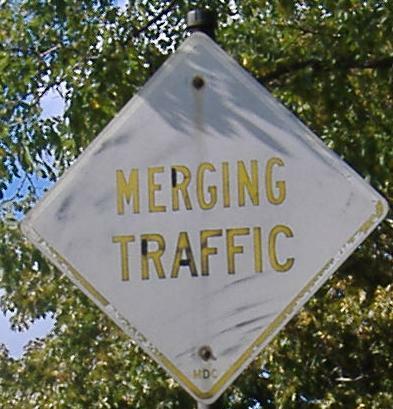 Traffic that continues on Boylston is forced into the Fenway overpass, former US 1 NB, so through traffic is directed along Ipswich Street. 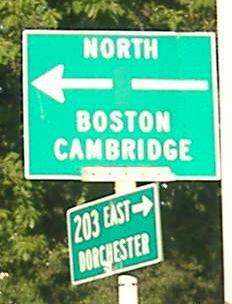 Since, as I mentioned, Boylston is a shortcut to the former US 1 SB, this sign at least once made sense. This sign is a block away from the far corner of Fenway Park on Boylston - you'd think with that many people who see it, someone would have gotten it changed. 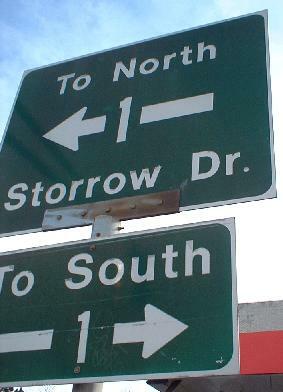 This is the old arrow-through-number style, dating to the early 1980s according to Chris Commans. Looking up at the bottom of the Charlesgate from Commonwealth Ave. It looks much cooler than this under there, maybe because the Muddy River is winding its way underneath to the Charles. 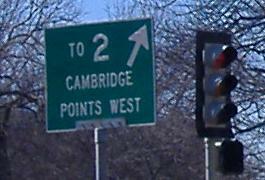 This assembly is at the bottom of the Charlesgate NB ramp to Commonwealth Avenue. Mass D.P.W. 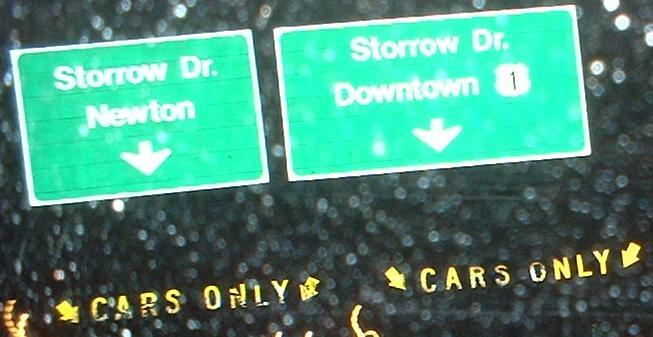 figured people would just know what Comm is short for. 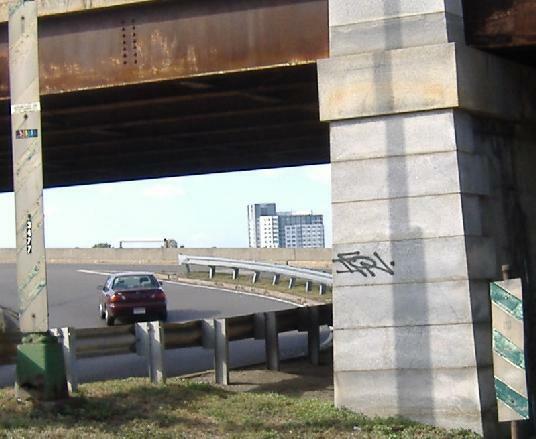 Old slash warning strips, with the NB ramp to Storrow Drive WB on the left and the ramp to EB (i.e. continuing old US 1 NB) on the right. 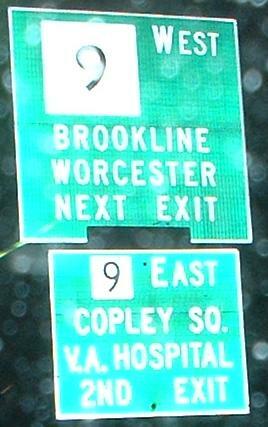 The aging sign is on the WB ramp, and that merging traffic is from Commonwealth Ave. and the rest of Back Bay.